Victory Motorcycles is out to make your riding experience one you can remember. Literally. 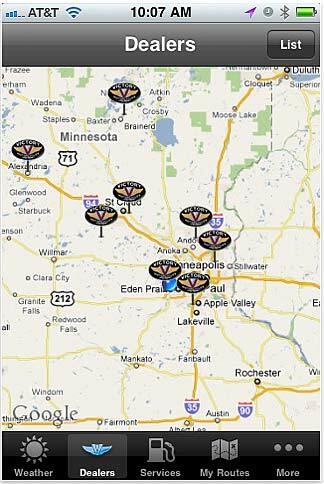 The boys at Polaris (Victory's parent corporation) have released (March 16, 2011) a must-have iPhone app called Victory Rides geared to riders in general, but Victory riders in particular. This is not their first smartphone app, they already have a similar one for Snowmobilers which was released in February 2011. Both apps are priced right: FREE! After the app loads, the default screen intuitively zooms to your current location but you can easily swipe the map the map to another area if desired. The app does not have the ability to enter an address, which would be helpful if planning a trip. In fact, this app is really all about exploring. Much of its functionality is based on using data about where you ARE and not so much where you WILL or WANT TO BE. This will be clear later on. The initial map screen is the "Weather" screen and has a variety of helpful "overlays" you can choose (Advisories, Radar, Satellite. Temperatures, Winds Speeds) presumably from the National Weather center. 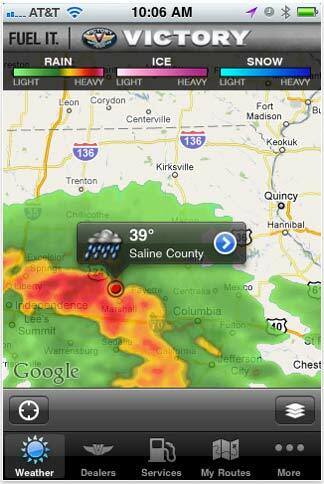 I found the Radar and Satellite overlays the most useful during a days ride in avoiding passing showers. Unfortunately the app does not allow you to select multiple overlays. I found I was constantly flipping screens to change overlays in order to obtain simple info. Another annoyance was that your overlay choice is not remembered once you quit the app. I would love to be able to set a particular overlay as a default view. Alternatively, I dig the fact you can touch and hold anywhere on the map and get a localized weather popup, no matter what overlay you've selected - a nice little feature if you just are scouting your next destination. The real meat of this app is it's tracking feature. There are a number of GPS devices that will do this but not the one I own so this was a biggie for me. Apple's multitasking ability of iOS4 really made this possible. True, it could be done on a iphone 3G but only if it ran in the foreground and never turned off. The ability to run the tracking feature in the background is key, especially to battery life. On my test ride tracking, I had the app running & tracking in the background for close to 2 hours and it only used about 15% of my battery. One of my tracking test was actually conducted on a commuter rail train in which I started tracking while the train was still in the station. The first 10 minutes it showed that I had moved around about 300 ft even though the train had not moved an inch. I attribute this to slight triangulation errors with the cellphone towers, well within my expected accuracy limits. Once underway, it tracked pretty accurately, even for not following any road (a street GPS might have trouble with this). My other rides were spot-on accurate and they all displayed the total mileage and travel time. After an hour of background tracking, the app does display a message reminding one that it is still tracking - a great feature for those who may have forgotten to pause (yes, you can pause and resume!) the tracking. Once saved, you are asked to name the route and it is then stored and displayed in you're My Routes screen. There is no ability to have it direct you to a route's Start or End point. Really, that's something I'd expect a full-featured GPS app to provide, not a first-blush free version from a motorcycle company. The Services feature is invaluable to any motorcyclist and Victory spent some good development time here. Choosing any one of the listed services (gas, food, lodging, dealers) brings up a list (or pins on a map) to the requested service type. You can also swipe the map to another location and get a popup button to research the new region - a smart little feature. I've found that when searching for a service, it occasionally will come back with a message indicating it was unable to obtain the data. Most likely this is a network connection issue and a retry will generally result in a successful search. 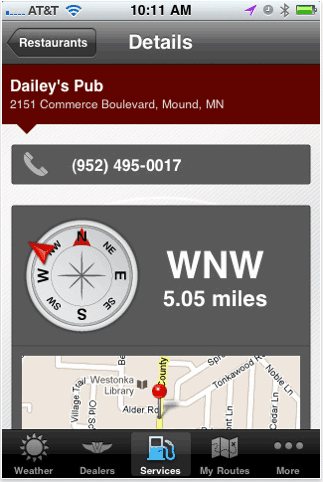 Once a search result (ie., dealer location) has been tapped on, the resulting screen gives integrated contact info (address & phone), map location, compass reading, miles to the destination and a link for directions to the target. 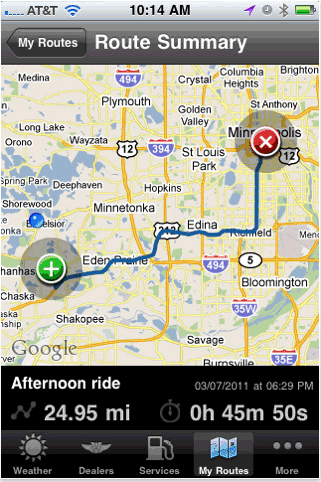 The latter engages the Google map utility which results in driving directions and map route. That's great integration with the iphone native applications! 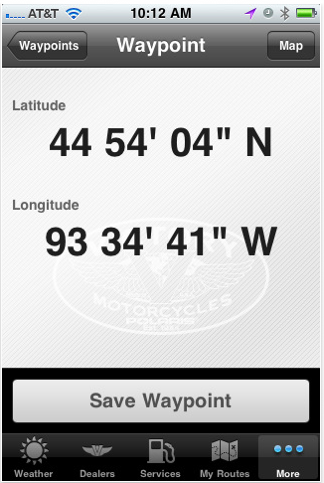 In Summary, the Victory Rides app is really a great app for any motorcyclist. True to their bikes, Victory put a lot of thought into this app and what it should do. It loads and performs quickly - a tribute to good efficient programming. The interface is very intuitive and easily readable at a glance and above all, the price is right! This is a must-have app. The ability to share routes. What good is a great route you can't share with someone through email or the iphone's "bump" transfer? The integration, as with services, to spawn Google maps for directions to a Waypoint. Displaying multiple Overlays in the map screen. The ability to set a "default" overlay that is remembered between sessions. In perspective though, no other motorcycle company has even attempted or come close to providing a motorcycling/lifestyle app such as this. Cudo's to the folks at Victory! I can only guess they are hard at work developing an Android version so I can wait for my iphone enhancements above... But not too long!! See you at a waypoint on the road!